Every summer P has gotten more and more courageous in the water. 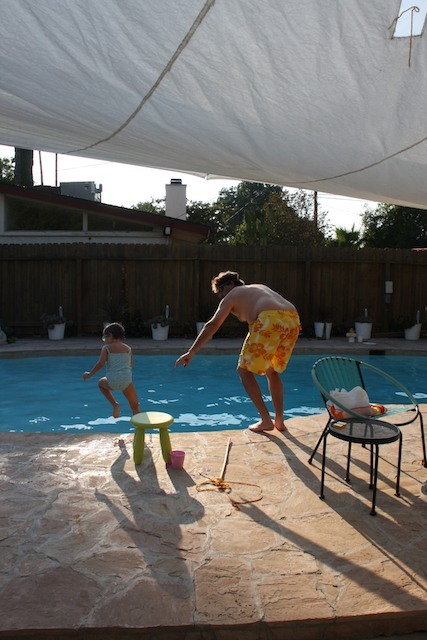 This was the summer she found the courage to jump into the pool. It seems so basic but I believe it’s a great leap of ability and courage on her part. I don’t know when it actually started but I do know it was with Dave. 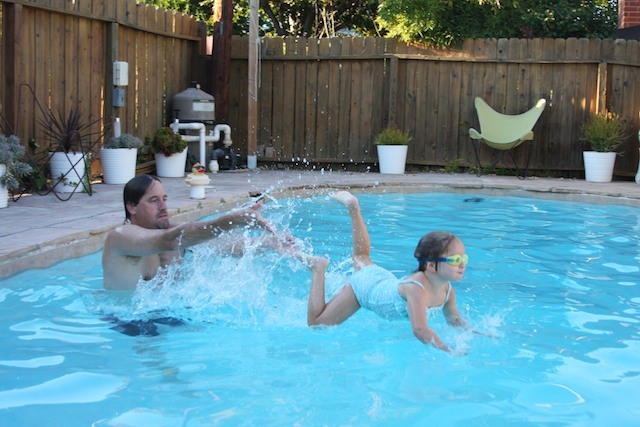 With him she found the courage to jump off of him into the water and then from the edge into the pool. It doesn’t matter how deep the water is, she’s jumping. I find it very interesting that I’m the one who pushes/encourages her to do more, to find her courage, to not give up but she always seems to find it on her own when she’s with Dave. When she was afraid to get back in the water it was me who talked her through it and asked her to find her courage. 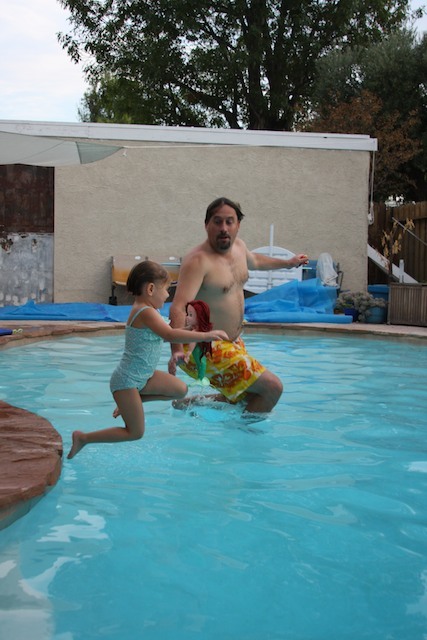 But her first lap across the pool, width wise, was with Dave. He doesn’t like to push her or to get her to finish what she started. It’s not something he was groomed with as a child. I also know when she wants the easy way out she’ll call for him. But after we’ve done some groundwork together I’ll walk away and bam! She rises on her own! To be honest, I’ve been hurt and frustrated that I put the work in and Dave gets to see the grand results. However, when I see the big picture….she does better without me, I think it’s a good thing. What I’m seeing is I am laying down the groundwork and helping her find whats within her. And when I’m gone she’s finding it all on her own. So, now I feel relieved that as she grows up, and her life becomes more her own, she’ll fly without me. To me, that’s the greatest reward.